It may be winter time, but I think we all need a break from the big, dark beers. So we're going with a big, hoppy beer. 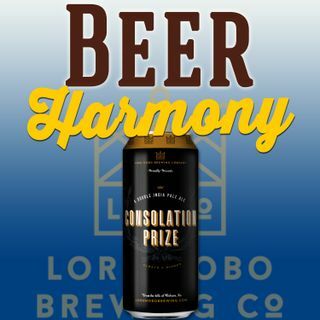 Lord Hobo Brewing Company's Consolation Prize is a hazy double IPA from one of the biggest names in hazy beers. Consolation Prize is resulting in flavors of pineapple, mango, and melon and sports a pilsner base. It's an easy to drink double IPA that hides it's higher ABV well, but will it be too hoppy to be a harmonious decision? We want to hear about your ... See More favorite hazy double, what is your go-to? Make sure to follow the show on all social media outlets @BeerHarmonyShow and check out www.beerharmonyshow.com for even more beer! Please send us your beer suggestions and show feedback to beerharmonyshow@gmail.com. You can find out more about Lord Hobo Brewing at www.lordhobobrewing.com. Cheers!